There is a massive sidewalk square replacement project going on in my neighborhood. Many years ago, the city offered homeowners the chance to replace sidewalk sections for $40 per square. I had a sunken square in front of the house. A city engineer came out, took a look and said they needed to replace two of the squares. Because I had initially called only about one and it was their determination that both needed replacing, I could get both done for $40. 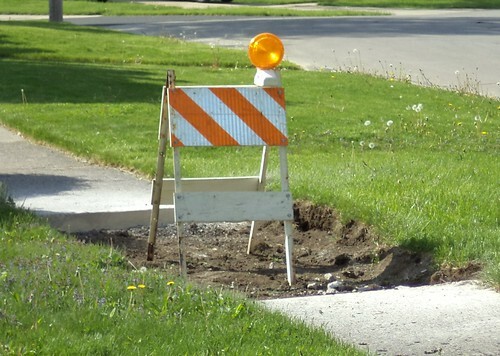 I missed that there might have been a call for more people to ask for sidewalk replacement. We used to get a city newsletter in the mail. Now, it's posted online. I rarely remember to check it monthly for news. There are a lot of these on my block. I have a cracked square in one of the pieces that goes through the driveway. I'm wondering if I had to call to have them check it or if they just walked the street and marked which ones would be replaced. I can't find anything in the city newsletter saying this was coming. It would be a slight headache to get into the drive if they removed the cracked piece. Neighbors across the street have had 2 squares in their drive removed. They have to park in the street until this is fixed. It looked kind of eerie last night, seeing all these flashing yellow beacons. This is one of those "it will be so nice when it's done" projects. In the meantime, drive slowly through my neighborhood. People will be walking in the street.